We Japanese community has developed for a year, finally we can release it! Is it based on a single region (eg Japan?) or is it a mix of various regions (eg Japan, China, etc)? This pakset model is based on Japan! Wow, that is fantastic, cant wait to try it out! Is the official name for the pakset "PAK256", or are you going to follow the syntax for the two (okey.. one and a half) existing paksets: Pak256.Japan-Ex? We developed it with the name "pak256" w/o "Japan". Is "Ex" a symbol for Extended? Is it required for Extended-compatible pakset? It is worth mentioning in the name that it is made for Extended, as in that case it isn't compatible with Standard AFAIK. Thank you for your explanation, so should our pakset name be “pak.256-ex”? I believe that there are no "laws" as such what the name should be, but Rollmaterial has a point in that the name could help avoid a bunch of confusion from players who maybe dont know so much about Simutrans (like the difference between Standard and Extended), so I would also suggest to have the -ex in the name. 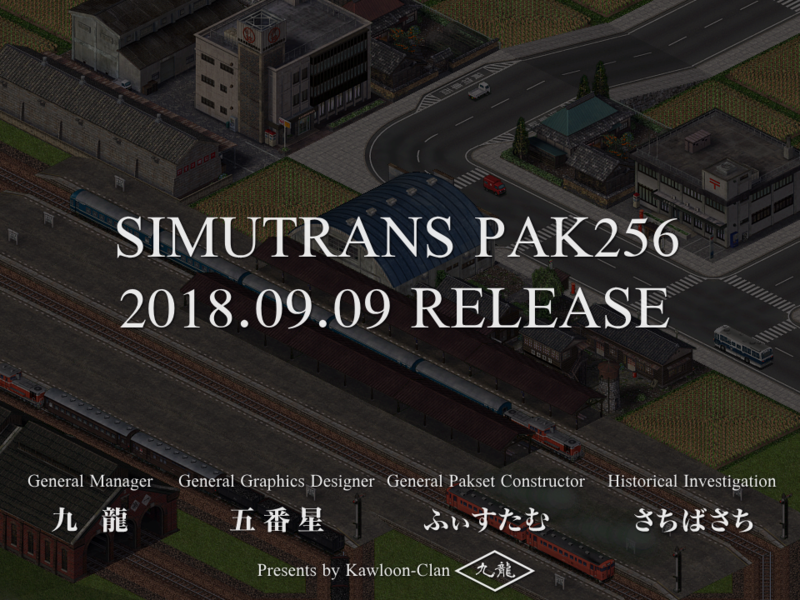 You write that this pakset is themed toward Japan, however if you look at the "Standard" paksets, you have Pak64 and Pak128, which both are kind of official paksets, and neither really have a country specific location (as far as I know). Most other paksets have in their name specified a country or another thing that makes them special, for instance pak192.Comic, or pak128.Britain etc. Do you have english translations? I understand what you say, but it is first 256 resolution pakset so probably users do not misunderstand what it is. pak.256-ex is very short name so I would like to use the name! en.tab, citylist_en.txt and streetlist_en.tab are prepared for you completely! The demo map city names use glyphs that are not part of the English locale font set as such appear as boxes. The pakset itself is very incomplete. There literally seems to be 3 road vehicles, a few trains and such. There does not even seem to be any railroad electrification despite there being constraints for it (maybe I am looking in wrong place). As you say, this pakset is incomplete currently. Electric vehicles and the other waytypes will be supported in the next update. Will buildings and vehicles from other countries be included in the pak, or only Japan buildings and vehicles are allowed in this pak? Just name the pak 'pak.256.JP-ex' had your team limit buildings and vehicles to be based in Japan. It's to indicate that your pak is based in Japan, so that some of us who do not want a Japan pak in mind will not waste time and energy downloading the wrong pak.